1. This offer is open to legal residents of Canada making purchases in participating stores in Canada. 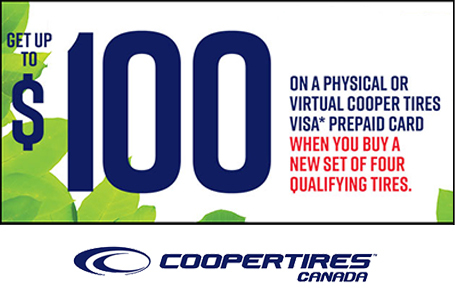 The offer is not transferable and is valid only for the individual who purchased four new qualifying Cooper tires in a single transaction for personal household use. Void where restricted or prohibited by law. 2. Properly submitted and verified claims will be provided with the reward (as described below) in Canadian dollars in the form of a Cooper Tires Visa* Prepaid card. Payment will be emailed to you from notification@prepaiddigitalsolutions.com with instructions for choosing a physical or virtual payment. A valid email address is required to receive payment. Use your Visa Prepaid card anywhere Visa cards are accepted worldwide. Card is issued by Peoples Trust Company pursuant to a license from Visa Int. *Trademark of Visa International Service Association and used under license by Peoples Trust Company. Failure to activate or use your Card will void the offer and relieve Cooper Tire & Rubber Company (“Sponsor”) of any further obligation. Lost or unused balances on Visa Prepaid Cards will not be replaced after the expiration date. If your Visa Prepaid Card has been lost or stolen before the expiration date and you have reason to believe that someone has made an unauthorized transaction with your Visa Prepaid Card or may attempt to use your Visa Prepaid Card without your permission, please call IMMEDIATELY 1-866-230-3809. No additional value may be added to this Visa Prepaid Card. Sponsor reserves the right to substitute an alternative reward of equal or greater value. 3. This offer is contingent on the purchase of a new set of four (4) qualifying (all four tires must be the same model) Cooper tires (in a single transaction) between April 1, 2019 and May 31, 2019. Reward requests submitted online must be received no later than June 30, 2019. Reward requests submitted by mail need to be postmarked by June 30, 2019. Late submissions will not be accepted. Allow 6 to 8 weeks after the Sponsor receives the request to receive your payment notification email from notification@prepaiddigitalsolutions.com. Be sure to add this email to your safe senders list. 4. Reward Amount: Actual reward depends on the qualifying tires purchased and the availability of qualifying new tires at the time of purchase. A $50 reward is available for the following qualifying tires purchased as a set (4): Cooper Discoverer X/T4™, and Cooper Discoverer A/TW™. $70 reward is available for the following qualifying tires purchased as a set (4): Cooper CS5 Grand Touring™, Cooper CS5 Ultra Touring™, Cooper Discoverer AT3 4S™, Cooper Discoverer AT3 LT™, Cooper Discoverer AT3 XLT™, Cooper Discoverer SRX™, and Cooper Zeon RS3-G1™. $100 reward is available for the following qualifying tires purchased as a set (4): Cooper Discoverer STT PRO™. Substitutions are not eligible. Available at Canadian Tire retail locations only. 5. Limit of one (1) reward per new set of four (4) qualifying tires purchased in a single transaction. Purchases must be for household use, and offer is limited to two (2) claims per person, family, household, email, or address. 6. Requests from groups, organizations or businesses will not be accepted. Offer is not available to the affiliated dealers of Sponsor, their respective owners and employees or immediate family members of such owners or employees. Offer not valid for business or fleet vehicles. Purchaser is responsible for all applicable taxes and other fees. This offer may not be combined with any other Sponsor offer. 7. Apply for your reward online or via mail. This offer is not transferable, so the name on the form must match the name on the sales receipt. Work orders will not be accepted. (1) Online: ca.coopertire.com/promotions. Follow the directions to enter in your name, address, a valid email address, purchase details and upload your receipt. (2) Mail: Complete the mail-in form. Please print clearly in large capital letters. This is the name that will appear on your Visa Prepaid Card. Include the original dated sales receipt, which must show the qualifying Cooper tires, purchase price and size. Circle the tire purchased, which must be one set of four (4) of the qualifying Cooper tires. Substitutions are not eligible. Please do not use staples when sending your information. Please mail to: “Cooper Tires Canada Take the Money and Ride Reward", PO Box 360, Whitby, Ontario, L1N 0L8. No reward will be issued for requests that are not properly submitted. 8. Keep copies of all documents for your records, as well as a record of the date your reward request was mailed. All submitted documents will become the property of the Sponsor and will not be returned. Please allow 6-8 weeks after Sponsor receives the request to receive your payment notification email from notification@prepaiddigitalsolutions.com. If you do not receive the payment email notification within 8 weeks, please be sure to check your spam folders or contact a Sponsor representative via email at COOPERTIREPROMOTIONS@360INCENTIVES.COM or call 1-866-415-5543. You must notify the Sponsor if you have not received your payment email notification no later than July 31, 2019. Claims of “lost materials” will not be honored unless accompanied by proof of receipt of materials by the Sponsor, such as proof of certified mailing. If you claim a reward was not delivered or was improperly denied, you will be required to furnish the Sponsor with a copy of all materials you submitted for verification. 9. Incomplete requests will delay processing. If any request is submitted by the deadline but is incomplete, the Sponsor’s representative will notify the sender by email, and you must resubmit the requested information or documentation within 5 days of receipt of such notice. 10. All decisions made by the Sponsor (or its authorized representatives) relating to the validity of any submissions are final and binding. 11. The Criminal Code of Canada prohibits acts of deceit or falsehood to defraud a person of money or property. This would include, among other things, the use of fictitious or assumed names or addresses in order to receive multiple offers. Tampering with, altering or falsifying purchase information constitutes fraud. Sponsor reserves the right to disqualify any individual who fails to comply with these terms and conditions or who disrupts or otherwise attempts to affect the administration, security, fairness, integrity, or proper conduct of this offer. Sponsor is not responsible for the security or privacy of information transmitted via computer networks or for breaches of privacy due to interference by third party computer “hackers” or otherwise. All decisions made by Sponsor (or its authorized representatives) relating to the validity of any submissions are final and binding. Sponsor reserves the right to disqualify any individual who fails to comply with these terms and conditions or who disrupts or otherwise attempts to affect the administration, security, fairness, integrity, or proper conduct of this offer. Sponsor reserves the right to confirm the identity of any reward recipient, including by collecting information about the recipient from third parties. The Sponsor is not responsible for delayed, postage due, illegible, damaged, mutilated, late, lost, incomplete, stolen or misdirected requests or for typographical or printing errors, or other technical problems associated with, or in any materials for, this offer. 12. Sponsor reserves the right, in its sole discretion, to withdraw or amend this offer in any way, or to amend these terms and conditions without prior notice or obligation, in the event of: (i) any error, technical problem, fraud, or any other cause beyond the reasonable control of the Sponsor that interferes with the proper conduct of this offer as contemplated by these terms and conditions; and/or (ii) any accident, printing, administrative or other error or any kind. 13. In the event of any discrepancy or inconsistency between these terms and conditions and any statements contained in any reward-related materials, including but not limited to the entry form, or point of sale, television, print, or online advertising, these terms and conditions shall prevail, govern, and control. 14. If you have questions about this offer, contact a Sponsor representative via email at COOPERTIREPROMOTIONS@360INCENTIVES.COM or call 1-866-415-5543.